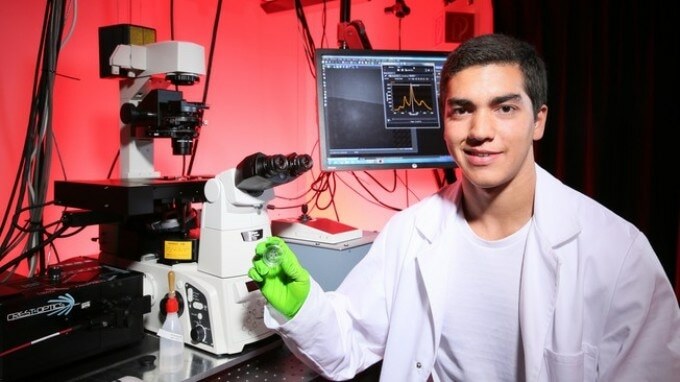 Edward Honein from the American University of Beirut has joined EPFL’s Laboratory of Nanobiotechnology to do his summer project under the supervision of Professor Ardemis Boghossian. Honein aims to develop a nanotube-based biosensor. Biosensors are devices designed to detect biological molecules (“analytes”) in water, air, or blood. They are used extensively in drug development, biological research, medical diagnostics and even security. Despite continuing advancements, there remains a need for better portable bio-sensing devices that are user-friendly for both Doctors and patients. The development of such devices would offer techniques for continuous, real-time monitoring of biomarker levels, which is crucial for several diseases such as diabetes. This is where Edward Honein’s summer project would be beneficial: he is building an optical, microfluidic biosensor that is capable of detecting single biomolecules in a scalable, high-throughput manner. The biosensor itself is composed of carbon nanotubes, which are rolled-up sheets of graphene. Nanotubes with diameters measuring as small as 1 nm and lengths up to several centimeters, and possessing unique physical properties have paved the way to a whole new world of technologies. One of these properties is discharging light in the near-infrared spectrum (700-2500 nm wavelength) when excited with a laser. Honein’s project takes ideas from the research of Professor Ardemis Boghossian, who heads the lab and integrates nanotube optics and biological molecules to search for a range of upcoming capabilities, including near-infrared biosensing. In her research, Boghossian has created nanotubes wrapped with single-stranded DNA, which serves as the actual sensing molecule for the target analyte. In our applications we use semiconducting nanotubes that have a specific energy barrier, called the ‘band gap’. When we excite the nanotubes with a laser, an electron is excited across this barrier into the conductance band. Eventually this electron relaxes, and in doing so releases a photon – which is what we see as emitted light. When the DNA - or a protein - detects the presence of a target molecule in the area of a carbon nanotube, the resulting interaction alters the 3D conformation of the protein or DNA, which then impacts the surface properties of the nanotube. These alterations influence the near-infrared light released by the nanotube and alters its signal. Honein is currently aiming to streamline the biosensor to make it scalable for commercial usage. This involves a lot of work: first to build the biosensor, then to characterize the sensor’s selectivity and sensitivity, and finally to incorporate the sensor into a working device. One possibility he is checking out is using DNA-wrapped nanotubes that have been immobilized into a gel, and then adding this gel into a microfluidic device. When you add your analyte, the signal of the emitted light changes – so you know you detected something. But depending on how nanotubes are dispersed in the gel, the intensity may change from experiment to experiment, which is inconsistent. In the end, the design and purpose of such devices are restricted by the capabilities of their nanotubes, which release light at different wavelengths based on their diameters. “Because they have different band gaps, they fluoresce at different wavelengths,” says Honein. “So you look at this wavelength of light and know that you’re detecting molecule X; then this wavelength of light means you’re detecting molecule Y." By using this property, sensors can be built with the ability to simultaneously detect multiple molecules using varying wavelengths of light. This offers a specific benefit when conducting multi-analyte analysis on more complex samples, such as blood serum, cerebrospinal fluid, urine and even opaque fluids like blood itself.